Another day, another new arrival for 2017; that's what I like about this time of the year. The last two newcomers were species which had been hibernation over Winter. This one, the Red Chestnut, spends the cold months as a chrysalis and then hatches when Spring draws near. 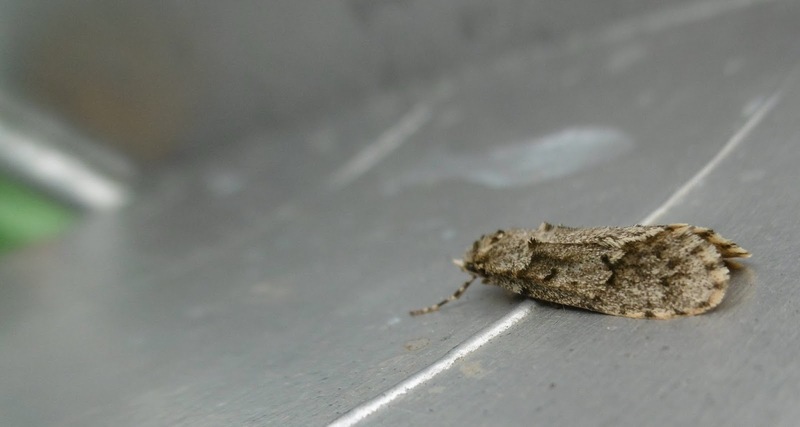 It's very far from my favourite kind of moth - one of the small, brown (or grey) ones which give me so much grief when I try to tell them apart. 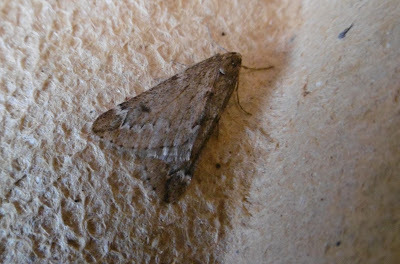 I cheated with this one by asking the kindly experts on Upper Thames Moths what it was. They are the ones who put me right. 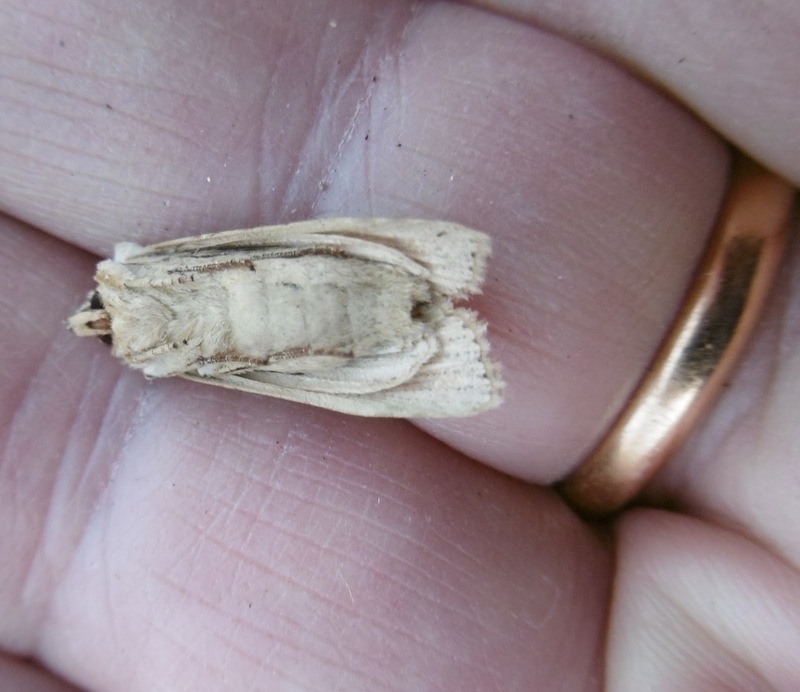 Like the Pale Pinion in my last post, the latest newcomer in the trap is a hibernating species newly-woken from its Winter sleep. 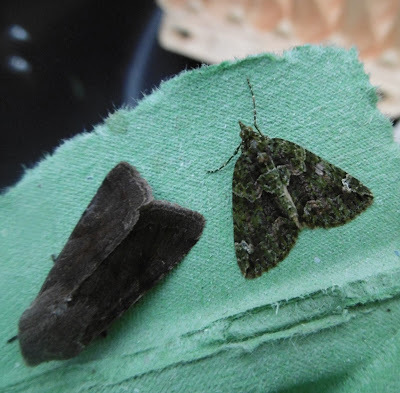 This (on the right above) is a Red-green Carpet, rather more red than green but certainly with a wing pattern as intricate as one of the Oriental rugs which inspired 18th century moth classifiers to dream up the name. 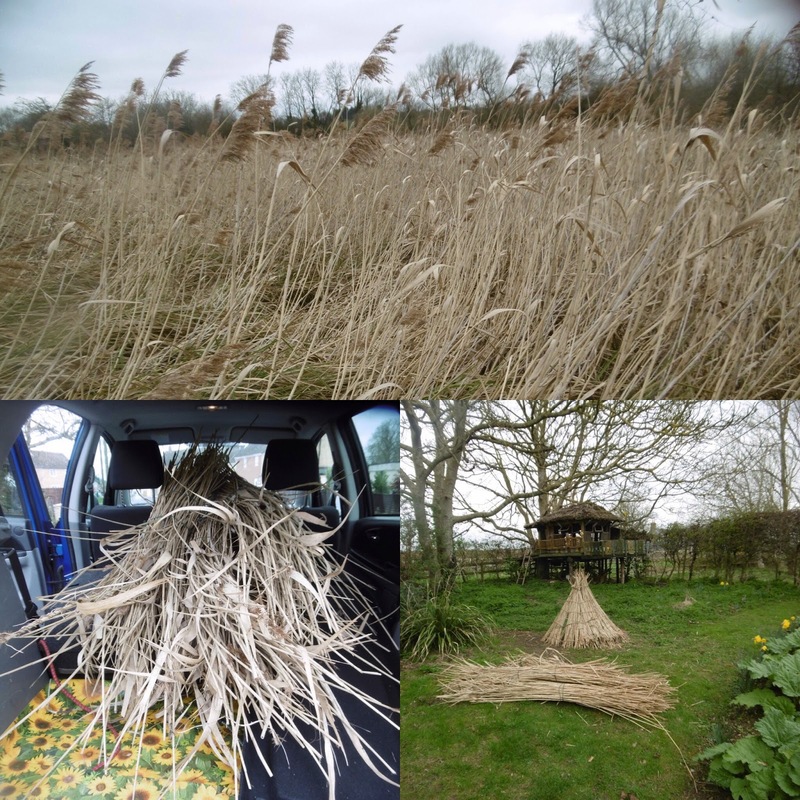 It will now set about breeding and its caterpillars will enjoy the local blackthorn which is turning the countryside white for miles around as it blossoms to mark the arrival of Spring. 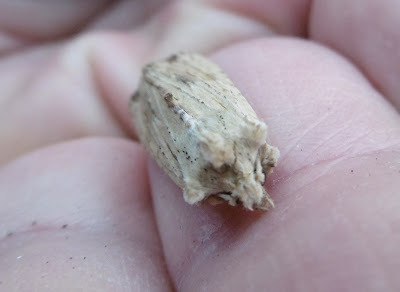 They then find leaf debris in which to pupate, another difference from the more energetic Pale Pinion larva which digs itself a little hole underground. 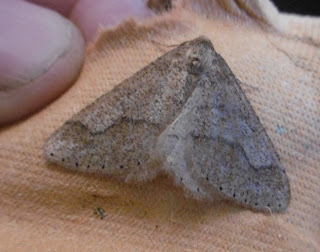 Apart from assorted dull Quakers and Clouded Drabs, like the one shown with the Carpet in my top picture, the eggboxes also played host to a lovely Oak Beauty. Not a newcomer for 2017 but I can't resist posting its picture. Nice to have something different in the trap the other night: a Pale Pinion, lured out of hibernation by the warmer weather - though, having said that, the nights are still pretty chilly. I am keeping my fingers crossed against untimely frost which could nip the Spring blossom, magnolias especially, which is cheering the world up so much at the moment. The Pale and closely related Tawny Pinions are interesting moths in that they resist the urge to mate which is so extraordinarily powerful in most moths - within hours in the case species such as the Emperor moth. Instead, the pinions fly and nectar contentedly in October and November before squirreling themselves into cracks in the bark of trees and going to sleep until March. 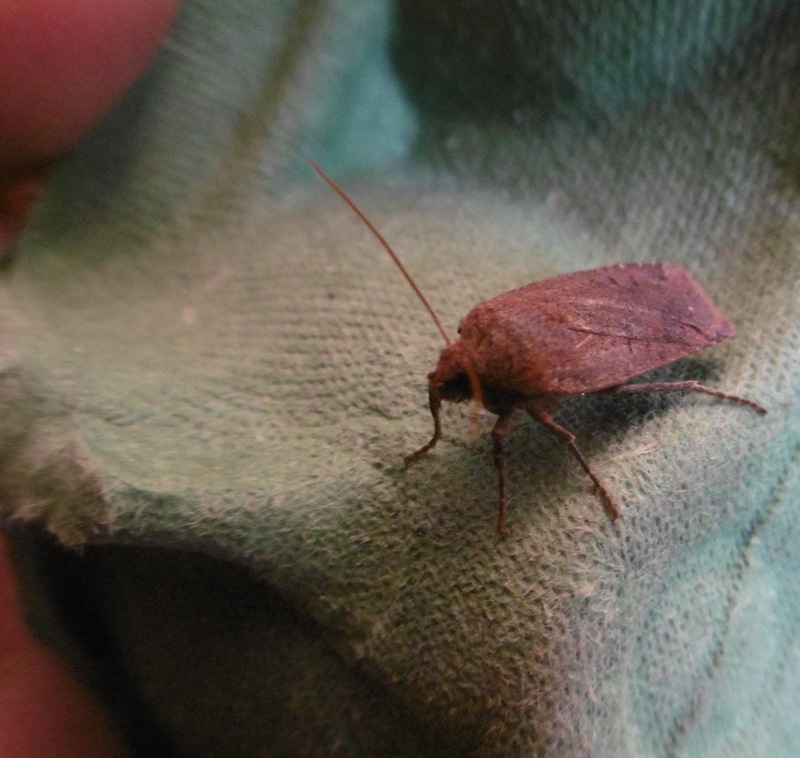 Then they re-emerge as this one has done, find a mate and start the cycle all over again. The unfaddy caterpillar feasts on ivy and bramble among many other plants before constructing a stout cocoon underground and beginning the process of changing into an adult moth. Otherwise, the trap paid host to the brethren usual for this time of the year: the Clouded Drab shown, three Common Quakers and a March moth. 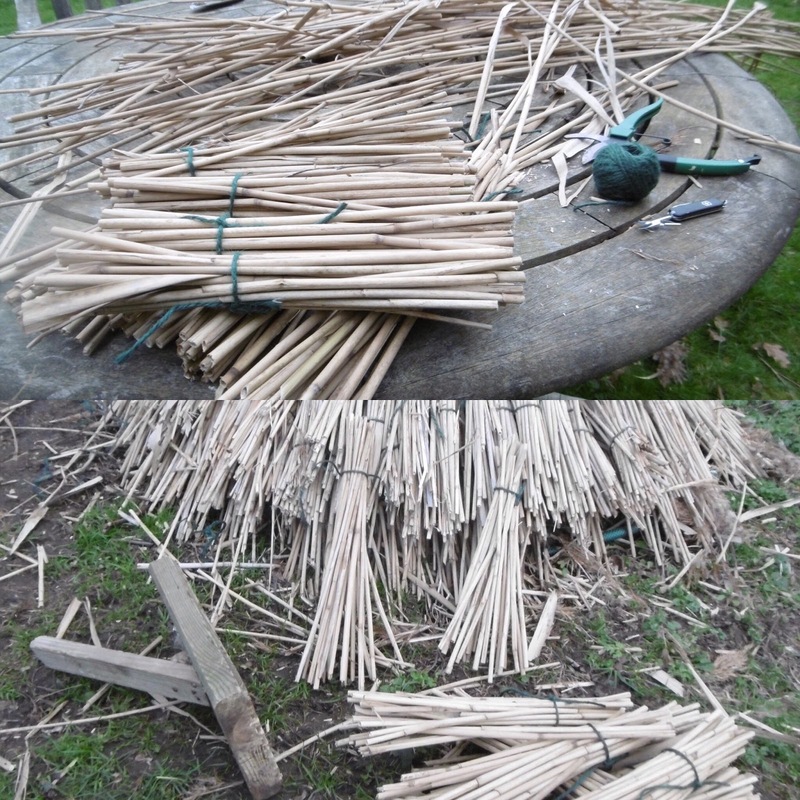 The weather has been see-sawing in a typically English way between lovely foretastes of Spring, even Summer, and chilly spells reminiscent of unlamented February. The mixture has distracted my attention from moths somewhat, coupled with the fact that a tower extension to the treehouse has seen me back in my thatching reedbeds. 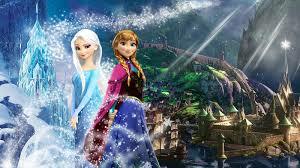 This time, I'm working on a conical design inspired (needless to say) by Queen Elsa and Princess Anna's castle at Arenedelle. The whole process, getting to the nearest reedbed a couple of miles away, cutting good specimens, trimming them into 'yelms' and finally whacking them into the underthatch with a 'leggatt' or 'biddle' - homemade from that useless stuff for the damp British climate, decking - is extremely enjoyable. Current moths, meanwhile, are contrastingly dull, although it's perhaps a little mean to say that when my attitude is partly the result of over-familiarity. Here's the range which visited last time I lit the lamp, five nights ago. Oh, and I should record the fact that after nearly two years' faithful service (twice as long as its predecessor), my mercury vapour lamp went phut. Fortunately, I had prudently ordered two from brilliant Watkins & Doncaster last time, so the trap went straight back into action. 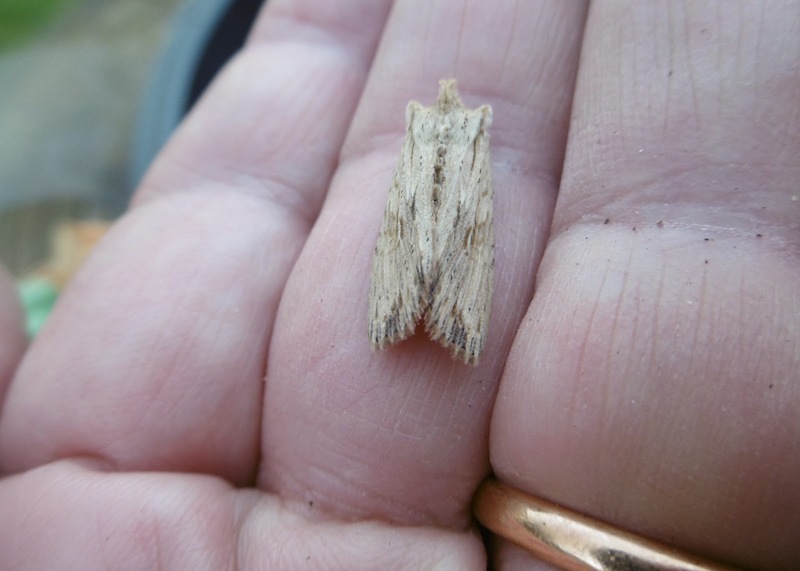 March Moth Update: No, I was careless - this is the well-known micro Diurnea fagella - many thanks to my Commentor below. After my slightly disparaging remarks about the Common Quaker two days ago, a whole host of Quaker moths arrived last night, turning the busiest trap of the year into a Friends' meeting house. 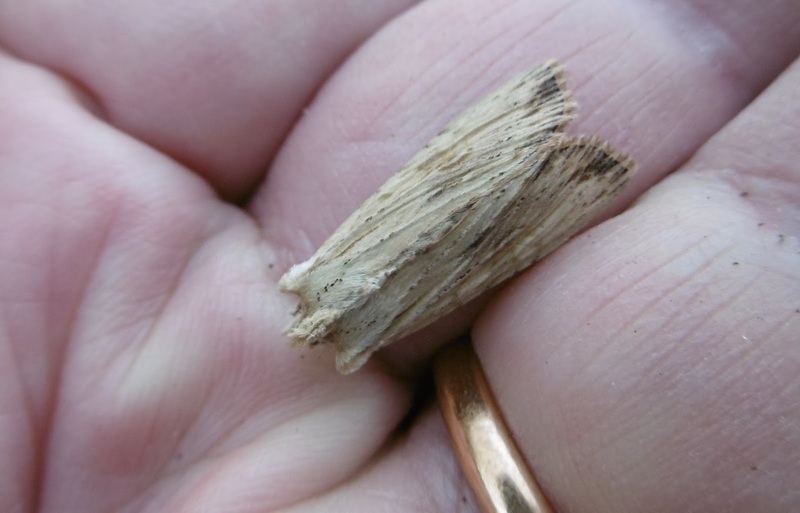 I can't be dishonest (and thus un-Quakerly) however, so I must stick to my guns and say that I find the Common Q a completely unremarkable moth. Fortunately, there were as many Small Quakers among the dozen or so visitors in the eggboxes and they are prettier altogether. All the moths in my top picture are SQs except the one at bottom left which is a CQ. I make up these composite pictures from the very good Layout facility on my Instagram system and here's another one, of four March Moths which were all on the trap's transparent plastic shield this morning. I was glad that I photographed them at 7am because when I went to get the trap to bring it indoors, to show the contents to my niece and her fiance (wedding in September, can't wait), they had all flown (or possibly been eaten by birds, though this seems a rare occurrence so long as they keep still). I think that I have another new moth for the year (along with the Small Quaker) below: a Chestnut. And after that, a couple of Dotted Borders, the darker one in the eggboxes and its very attractive, lighter companion out on the shield with the March Moths. Finally, a wasp of some maevolent-looking kind. Poor thing, it probably does no harm and possibly much good. Another pair of new arrivals for the year. Both predictable: I am keeping pace with previous years and comparative scoresheets such as the excellent Hants Moths Flying Tonight. 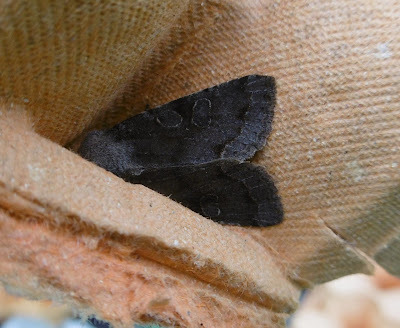 Above is the Dotted Border; two were snoozing on a wall about ten yards from the trap, one was on the cowl (handy, because I can illustrate its underwing in today's second picture) and two more were in the eggboxes. You can see how they got their name, especially when seen from below. 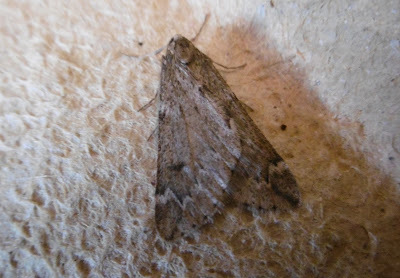 Below is a Clouded Drab, a big and very variable moth which had found a niche on the wall behind a stick, left leaning there. 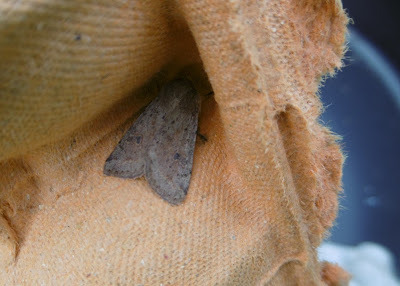 My final picture is of a Hebrew Character, one of the three cosying up with the Dotted Borders in the trap. It was a mild night but I note from last year's records that we had a heavy frost on 28th April. So don't lower your guard yet. Having said that, yesterday's lovely and genuinely warm sunshine brought me my first Brimstone butterfly sighting of the year and there was a Vanessid butterfly, either a Red Admiral or a Peacock woken from hibernation, skittering around the garden in the early afternoon. Sorry, I've been hopelessly slow to record the first really nice moth of the year. In addition to my onerous grandparenting duties, I am now madly resuming my sculling career at the age of 66 and also considering whether to try to learn to play the bugle (the latter simply because we have an old one, and it seems sad that it never makes those beautiful calls). Anyway, here is the said nice moth - an Oak Beauty, one of two which came together on Friday night. 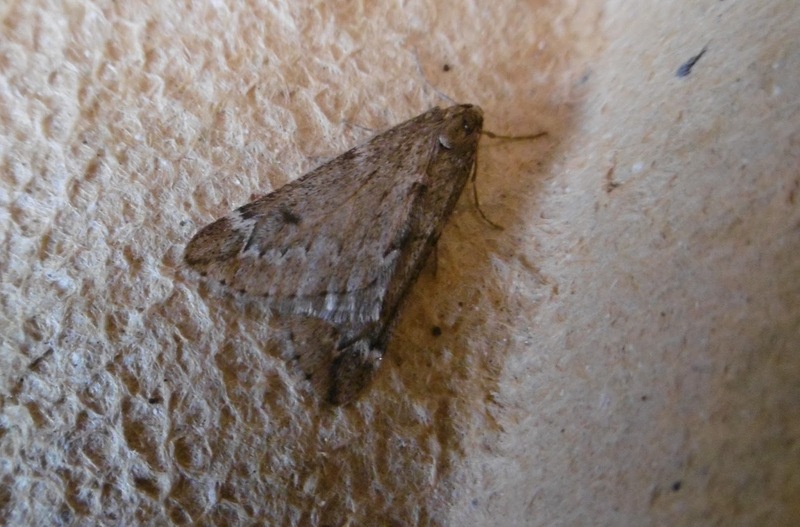 Its contrasting bands of russety brown and mottled greys produce a delicately appealing pattern which is also an effective camouflage. As shown in the picture immediately above, it also has terrific antennae. 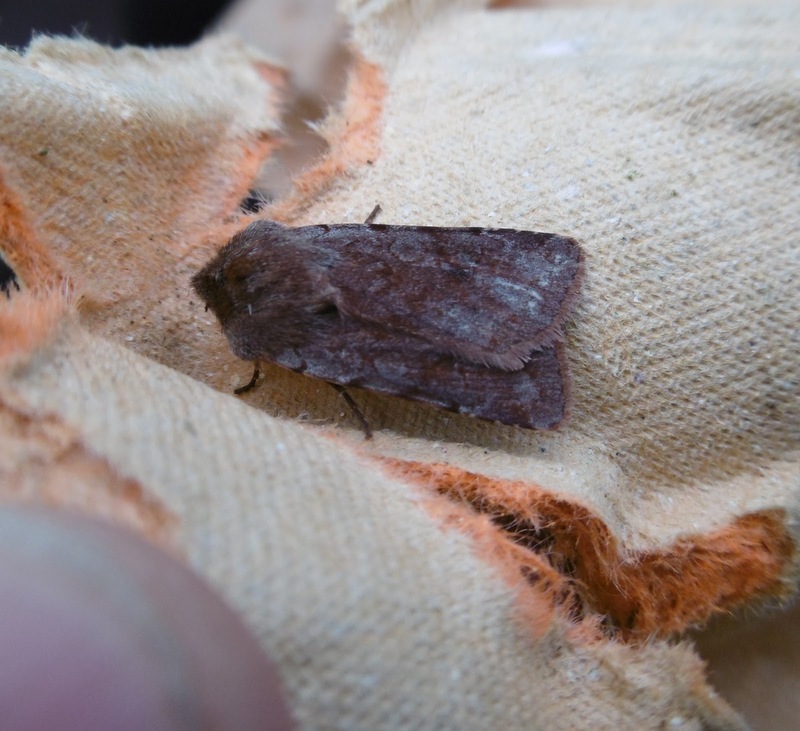 Just for the record - as sadly it is a contrastingly dull-looking species - I should note the year's first arrival of a Common Quaker, below. Apologies to the late George Fox and the Religious Society of Friends. On the downside, my final picture shows what I fear is the fate of the March Moth which Penny spotted on our bedroom ceiling. 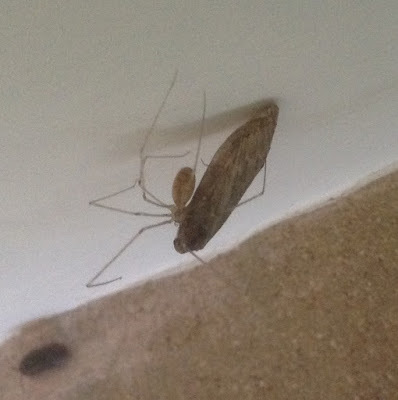 Indoors in our house is no place for frail winged creatures as we are spider tolerant (being relaxed about housekeeping and past readers of Charlotte's Web). 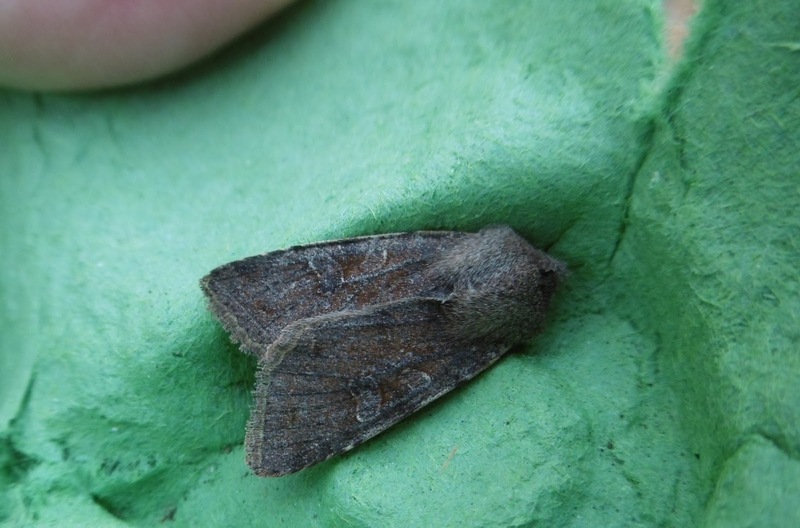 My species list for 2017 has crept up to four, thanks to Paul Hopkins' knowledgable comment on my last post, plus the arrival of a March moth two nights ago. 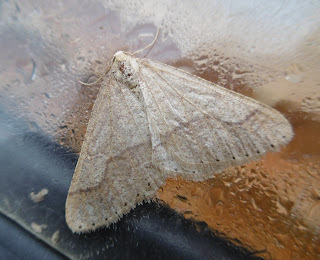 This was my first trapping session for March so its appearance was timely, and also welcome since we had a friend staying overnight who was interested to see how moth trapping worked. 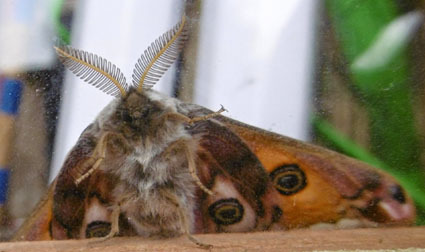 The familiar isosceles triangle shape of the moth was the only inhabitant of the eggboxes, following a night which turned out to be colder than the temperature suggested at dusk. 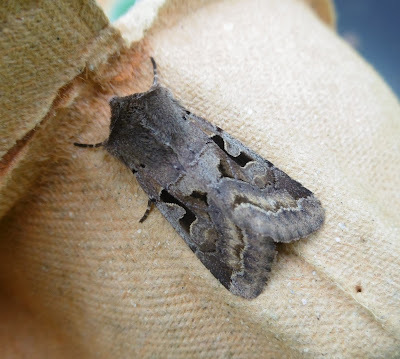 After examining it and admiring the camouflage effects of its modest colouring and slightly dazzle-y pattern, we released it in the garden and bade it farewell. 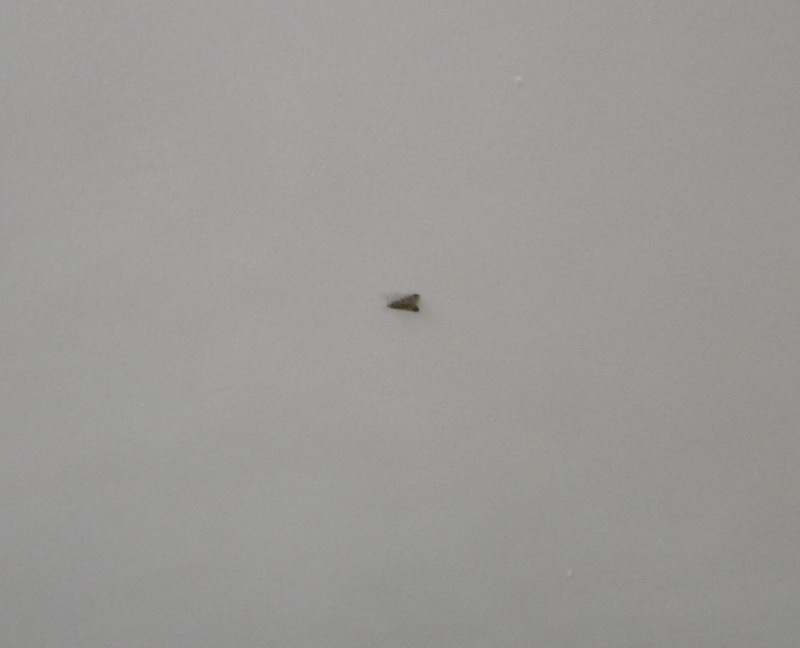 Last night, however, eagle-eyed Penny retained her long-standing title as Top-spotter of Indoor Moths by drawing my attention to this - pic below - on the kitchen ceiling. When we went to bed some hours later, there on the bedroom ceiling was another one (or possibly the same one, if it was of an exploring bent). I would be very surprised if these indoor March moths, or moth, were the same as the one we released outdoors. 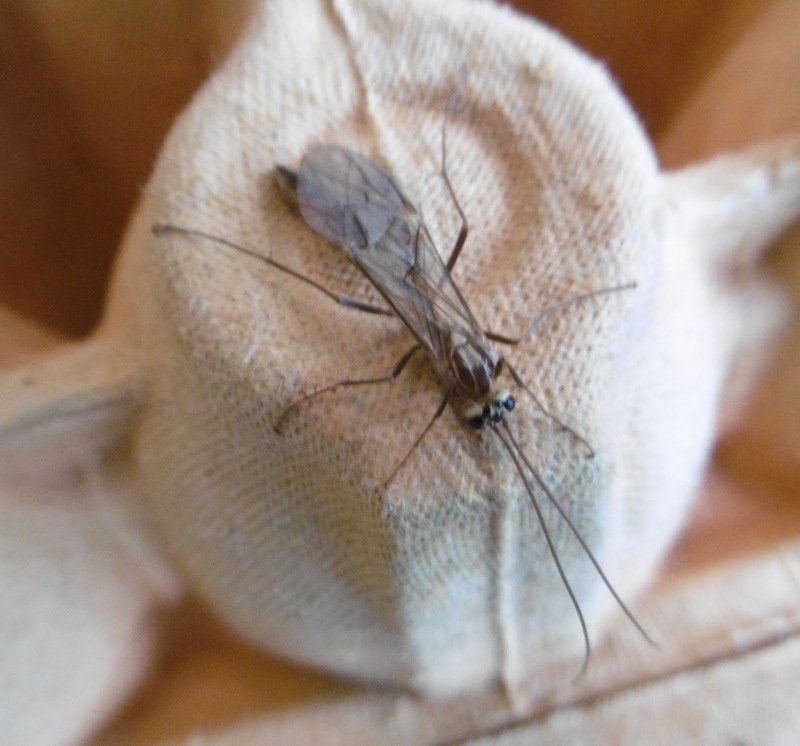 So the moral is, that I should look more closely when I examine the contents of the trap (which I had brought into the kitchen so that we could examine its contents out of the rain). 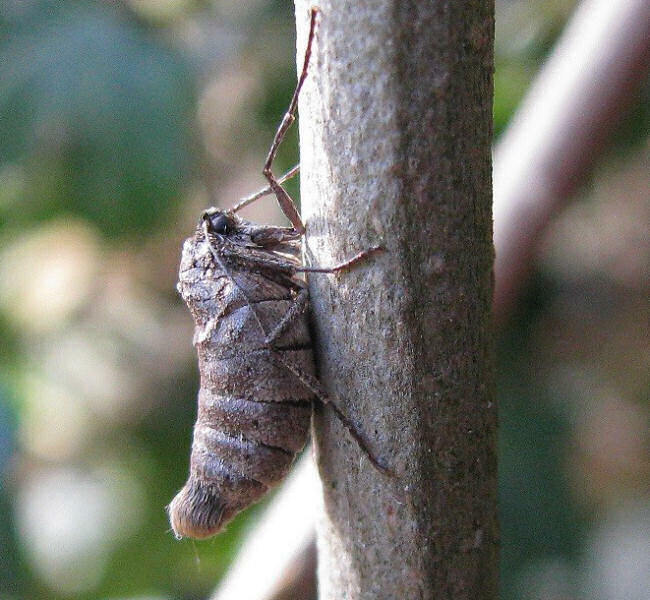 The March moth, incidentally, is another of the species - mostly winter-flying - whose females are flightless and spend their short lives scaling tree trunks while emitting pheremones which invariably attracts mates. And so life goes on.